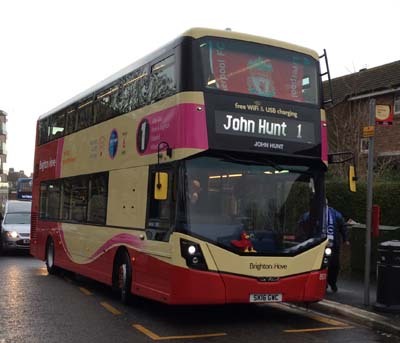 Connections with Brighton and Hove : Brighton & Hove bus driver for over 39 years died suddenly on 20 December 2017. His funeral – which took place at the Downs Crematorium – was attended by hundreds of colleagues, past and present and from every level. Paul Stringer did a superb tribute to John. “I would like to thank everyone for the support they have given each other, for the amazing turnout at the funeral and for the help that all depots gave so that others could be there and yet still covering all our service obligations to our communities. Absolutely outstanding work. “I would also like to thank everyone for their generous support for the collection for the Hillsborough Families Fund. 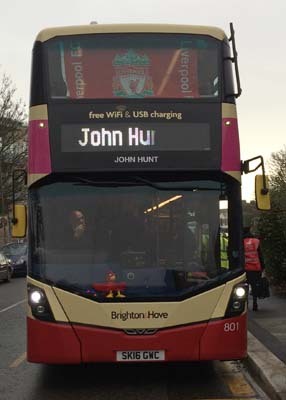 YNWA.” John had worked for the company for just shy of four decades, starting out as a conductor and moving into driving at the start of the 80s. He was viewed as a father figure – especially by those new to the job who he immediately took under his wing. He had time and banter for everyone. He was an avid Liverpool fan and an Albion season holder. Many colleagues remembered him at his funeral by attending in football shirts. John has left behind his partner Lisa and their adult children Craig, Paul, Gavin and Claire and a very big hole at Whitehawk depot. 801 Mercedes Streetdeck on Route 1 - carried name since 15 January 2018.